Judy Lincoln’s can do attitude and contagious enthusiasm for AHP and its members shows she’s got the spirit. The AHP “spirit team” has a new teammate. Judy Lincoln joins a list of enthusiastic AHP supporters including previous award winners Chris Brune, Lua Oas Southard, Barrie Reightler, Ellen Kiser, Daniel Lew, Christy West, Becki Pitcher, Doug Hayes, Pat Trowbridge, Jennifer Bryant, Kim Brown, and Cheryl Erpelding. Each of these past winners brought a special quality to AHP whether it was laughter, encouragement, mentoring, or talent. Lincoln was surprised with the 2016 AHP Chris Brune Spirit Award at the Special Awards Luncheon on Saturday, June 18, 2016 at the “May the Horse Be with You” Seminar in Orlando, Florida. “Surprising someone who not only works with you, but also lives with you, is a feat, but we did it,” says Chris Brune, AHP Executive Director. Lincoln serves as the coordinator for the AHP Student Programs and Equine Industry Vision Award. She assists with both the annual awards contest and seminar, two of the association’s major projects, in addition to her general office duties. She grew up showing American Quarter Horses with her family during the late 60s to early 80s. She traveled extensively with her parents to major events such as the All American Quarter Horse Congress and Florida Gold Coast Circuit. She owned and showed several Quarter Horses until she entered college. After graduating from the University of Massachusetts, Dartmouth, Lincoln went to work for Eastern/Western Quarter Horse Journal, where she eventually became Managing Editor. During her 16 years with the magazine, she had the opportunity to be involved with AHP members, awards contests, and seminars. Publisher, Ruth Brown, served as the AHP Executive Director for several years, and Brune, who was the magazine editor for 20 years, managed the awards contest and assisted with seminars. Prior to joining AHP, Lincoln worked as a Customer Service Representative in the screen-printing industry. Six years ago when her husband, Gary, retired from his administrative position as a high school principal, the couple left Massachusetts to move to South Daytona, Florida. Gary has become a familiar figure at AHP seminars assisting with the student fund silent auction and seminar. Both Lincolns have been active participants in the themed events held during the seminar recently playing the roles of Professors Dumbledore and McGonagall at the Horsewarts School of Equine Media student award party in Orlando. The Lincolns have two children, Matthew, sports director at WPEC, CBS12, and Jessica Zutaut, a speech pathologist. In 2015, the couple joyfully accepted their new role as grandparents to Matt and his wife, Lara's twins, Theo and Scarlett, who live in West Palm Beach, Florida. The AHP Chris Brune Spirit Award was initiated in 2004 as a way of recognizing the efforts of members and staff other than the Board of Directors. 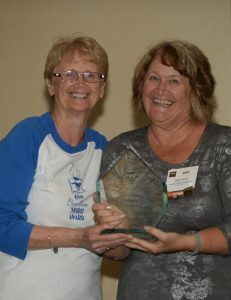 The award was developed to encourage members to seek involvement in the association that would eventually lead to leadership roles. The recipient is an individual who has done the most consistently to assist and support the association. The Board of Directors selects the winner at its board meeting. In 2004, the inaugural award was presented to Chris Brune and the title became the AHP Chris Brune Spirit Award. American Horse Publications is a non-profit association promoting excellence in equine publishing media. Its members include equine-related print and online media, professionals, students, organizations, and businesses which share an interest in equine publishing.